Unless this is the first time you have visited this blog, you know that my son is obsessed with dinosaurs. 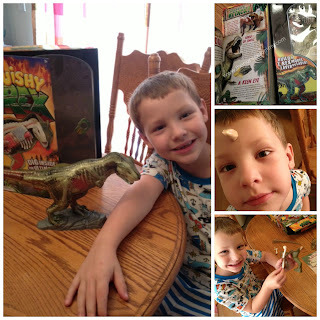 Recently, I contacted SmartLab Toys to review The Amazing Squishy T Rex. Not only was this a fabulous father and son bonding time building The Squishy T Rex, it also came with a really neat book to read. This fabulous toy came with T. Rex shell pieces, five squishy parts, six bone pieces and three muscles. My son especially liked the tongue because he put it on his forehead and said he looks like a Triceratops. All together this toy took about 15 minutes for my six-year-old and his dad put together. Our son was so excited he was bouncing around while it was being put together. Daddy might have enjoyed putting the squishy T. Rex together, but mommy enjoyed reading The Mighty T Rex. This 24-page, full-colored book tells lots of fun facts about the Tyrannosaurus Rex. It gives much more detail than I have ever seen in any other dinosaur book. It tells exactly about the body composition of the T. Rex as well as modern birds. Considering that Hubby and I are both nurses we like to teach our son about anatomy, so teaching him about anatomy of a T. Rex is very cool. Before reading this book I was convinced that my son to tell you anything about a dinosaur, after reading this book I know that he learned quite a few things. Win it: Our son had so much fun with The Squishy T. Rex from SmartLab Toys, I know that the child in your life well too. 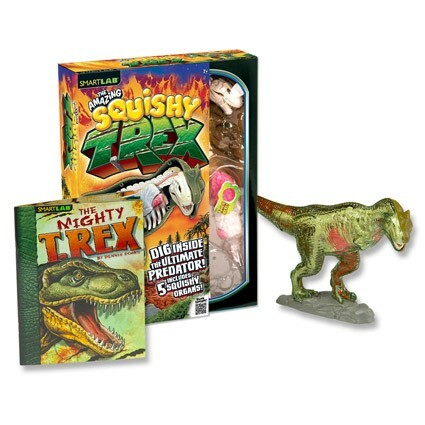 One lucky winner will receive this squishy T Rex that includes the mighty T. Rex book. The Glow in the Dark Lab!! weird and wacky contraption lab--think that would occupy my sons for a long time! My son would love the Mega Wild Animals 3-D Puzzles. I have a few granddaughters who would love this Weird & Wacky Contraption Lab, they love putting things together and this looks like a lot of fun and hands on activity. I like the Demolition Lab: Triple Blast Warehouse. Love the squishy human body! Oh this is neat! I know a certain 8 year old boy who would love this. He loves dinosaurs. While I wouldn't really love the Bug Playground, I think my son would. The squishy human body. We got to feel a real lung last week and they thought it was so cool. My son would love the Bug Playground. My son would really like the squishy brain kit. That looks like a lot of fun. I would like to get the All-Natural Spa Lab. I think that would be a great package to get. My son would love the glow in the dark lab!! My kids would also love the Squishy Science from Head to Toe! I'd love to have the Glitter Art kit for my kids. I think the bug playground kit would be cute! Id like the Squishy Science set! We would also like to have the You Track it Weather Lab. I would like the robo bug or the squishy body,alot of great things to make learning fun. I love all the science kits! I like the glitter spa lab, and the all natural spa lab, lots of things that kids would love on this site! My daughter would love the Glow in The Dark lab! I think my daughter would enjoy the All-Natural Spa Lab. I like the bug playground and I know my little one would love the brain fart!